Any DJs in the house? Aspiring ones, or whether you just want to have a go at mixing some tunes, playing with some music, or just editing your favourite tracks. 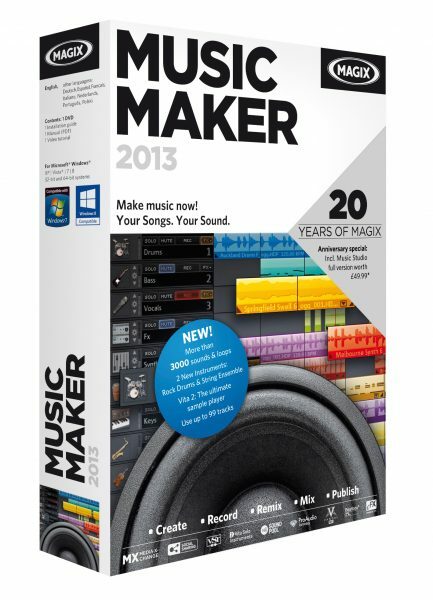 The Music Maker 2013 is the software for you! Make your own cool tracks with MAGIX Music Maker 2013. Even beginners can get amazing results in no time at all. With the audio building-block principle, useful tutorial videos and endless options, you can easily create your own songs and share them with friends. With over 3000 loops, MAGIX Music Maker 2013 has everything necessary to make real hit singles just like the ones on the radio. The huge selection of loops and sounds are professionally produced by top musicians from around the world and include a wide variety of genres like Hip Hop, Rock Pop, Tech House, Chillout, Eurodance or Electric Jazz. New effects and instruments that are normally reserved for professional DAWs are all part of the deal and bring the sound to the level of a real studio production. Four lucky winner will be chosen at random from the entries at midday on the 2nd of September, 2013. The closing time will be confirmed nearer the time through Facebook and Twitter, so make sure you have liked our page and/or follow us! Once the winners have been chosen, an announcement will be made on both Facebook andTwitter and in the comments below, and we will get in touch with the winners to get their address so we can send them their prize. Standard Ts&Cs apply. Open to over 18 UK residents only. Thank you everyone for participating! The competition is now closed, and we have another awesome competition running! We will be getting in touch with the winners soon, and get your details! This is awesome. My son would love this. great comp and prize – would def enjoy this! Sweet bananas this looks good! Fantastic competition, my son would love this! If anyone needed such a perfect prize I needed this one!! !